The c-change campaign runs a fun and varied calendar of events and campaigns across all our campuses, throughout the academic year. Our Green Impact departmental awards scheme, rewarding staff for their efforts to green their workspaces, and offering skill-boosting volunteering opportunities for students. 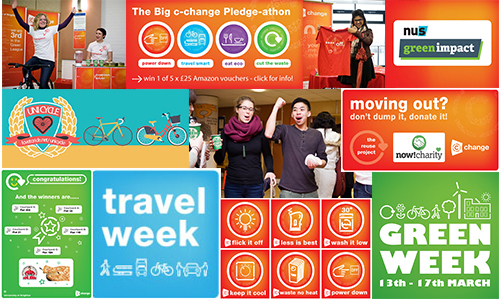 An annual Travel Week, promoting sustainable transport alternatives, with travel freebies, info, advice, games, a [travel challenge], and free bike doctors. A Big Xmas Switch Off campaign, challenging staff and students to switch off as many energy-guzzling lights and pieces of equipment as they can, before leaving for the Christmas break. An annual Green Week, packed full of environmentally-themed events, activities, competitions and a Big c-change pledgeathon campaign. An annual Bike Week, promoting the joys of cycling, with cycling freebies, info, advice, a [cycle challenge], free bike doctors, our very own smoothie bike! A halls recycling competition rewarding students for recycling well in halls. A halls Reuse Project collecting unwanted items from students leaving halls of residences, and donating them to a local charity.